The Main Room is designated a quiet study area. It includes PC and Mac workstations, and a multi-page scanner. This room also contains the SXU Author book collection, a small Manga collection, and the New Books display to the left as you enter the room. Please see our page describing the Art in the Library. The library maintains a very limited campus archive collection, with material submitted until 2009. After that date, all records are maintained in individual units. 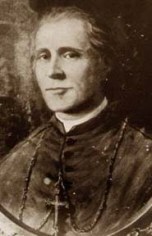 The majority of the materials are in three collections: Photograph Collection, SXU History, and President's Papers. There are internal inventory files that provide some keyword access to these unprocessed folder-level materials. The papers are not public, due to the privileged information contained in many of the materials. Contact the library staff for additional information. The harp is a Lyon Healy, serial number 585, a Style 26, built circa 1895. It has notable composers’ busts at the top of the column: Liszt, Beethoven, Wagner, Bach and Hayden. 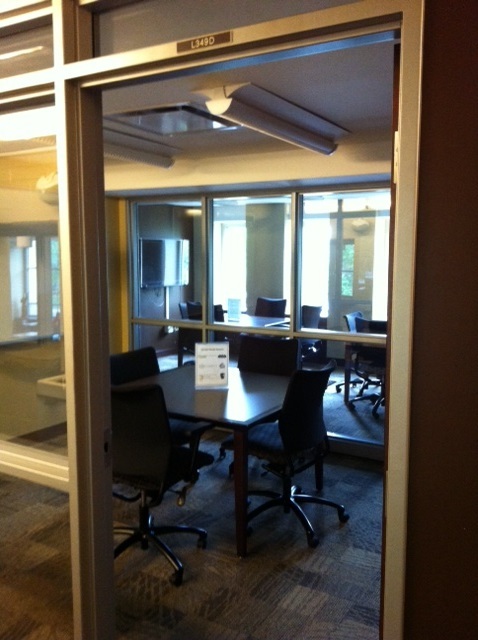 Quiet study rooms are located on the lower level, and cannot be reserved. There are two rooms with individual carrels, and another room with comfortable couches and chairs. 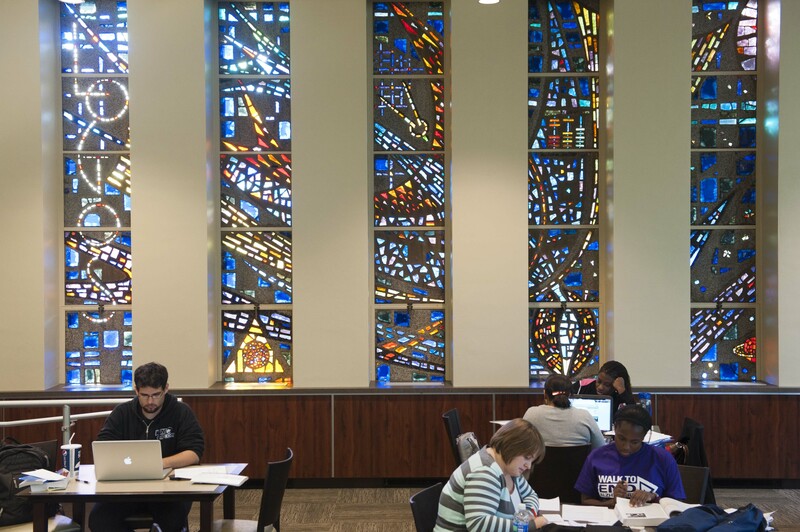 The Library provides group study rooms for SXU students. The upstairs room reservations can be made using a link from within the Resources area on your mySXU portal page. These rooms are ONLY for current SXU students meeting outside of class. SXU students may reserve assigned rooms in one-hour blocks to a maximum of 4 hours per day. Groups of 2-4 may reserve room L349 D,F,H,J, or K, all of which have wireless access, whiteboard, and display monitor. Groups of 4-8 may reserve room L349 C, E,G, or I, all of which have wireless access, whiteboard, and display monitor. L349C does not have a display monitor. 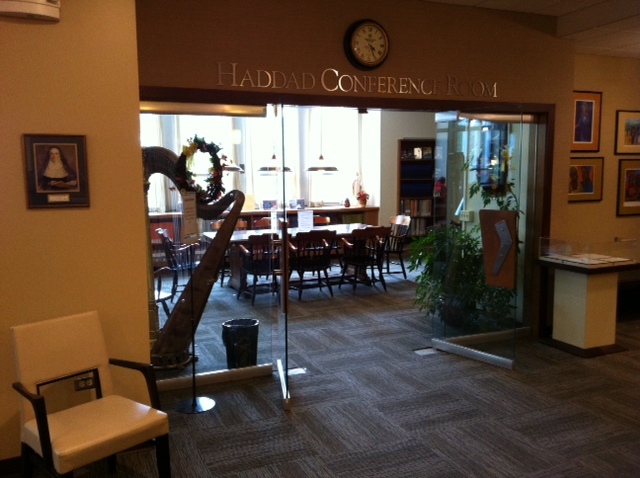 Groups of 4-10 may reserve the Haddad Conference Room, which has a DVD player, monitor, and wireless access. You can check out display monitor connector cords at the Circulation desk; plug your laptops into the box on the wall -- NOT directly into the monitor. There are two first-come group study rooms downstairs. 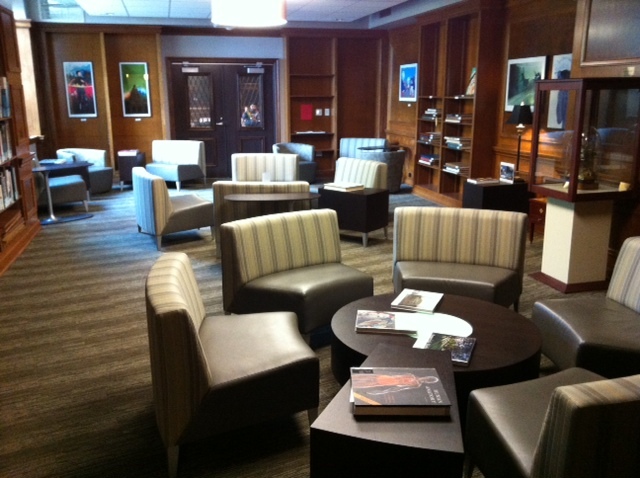 These spaces may be used for quiet group study, as they are within designated quiet areas. The Juvenile Collection room is one of these spaces. Feel free to use this space for studying, but be aware that you may be asked to vacate the space when a person needs to use this collection. Downstairs Group Room: Feel free to use this space, located in the back corner of the stacks, for studying, but be aware that you may be asked to vacate the space when a podcaster asks for use of the room. Podcasting students always have priority use of the small downstairs room. There is one small first-come group study room upstairs in the back corner of the stacks. This area is for quiet group study, as it within the designated quiet area. Feel free to use this space for studying, but be aware that you may be asked to vacate the space. This A/V Room and Podcast Room must be relinquished immediately for AV use on demand, and podcasting students also have priority use of this space. Just inside the doors of the Library is the beautiful Bishop Quarter Room, named for William Quarter (seen on the right), the first bishop of Chicago, who brought the Sisters of Mercy to the city. 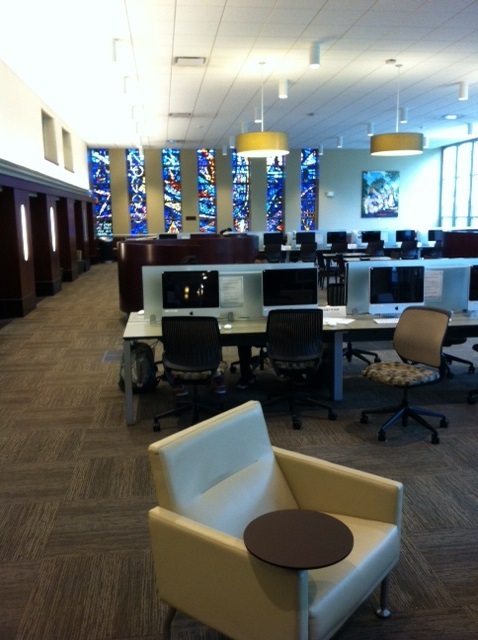 The Bishop Quarter Room is the primary large group study area for students in the library. It is a very popular congregation area, containing the Oversize (primarily Art) materials and a provocative art gallery containing student art. The room may be used as a reception room for honored guests, and on occasion houses special events. Honored guests have included John Podesta (February 2001) and General Colin Powell (September 2007). The Library placed a time capsule in the wall behind the lobby desk at the end of its summer 2011 renovation. The capsule will be opened in September 2061. It includes letters from President Christine Wiseman and the library director; Library brochures; a crucifix and rosary; the SXU prayer book, magazine, student planner, and calendar; the front page of the Chicago Tribune; a computer game; renovation photographs; a flash drive; and a variety of SXU memorabilia. It also contains a few surprises.